I wanted to share some of the details about where BWG is going. 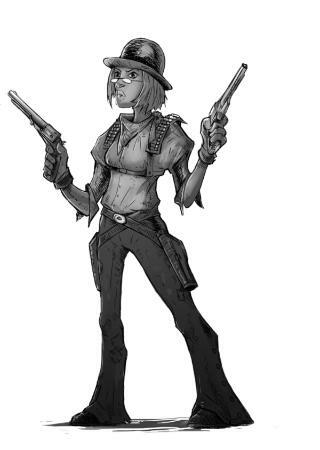 Long story short, we're making a Blackwater Gulch board game next. Now for the long story... No dates set, other than "Kickstarter in 2015" so maybe upcoming is the right word to use yet. As usual, I like to bounce ideas off people, so here we go. At this early stage if anyone has any good suggestions, they could get added in First things first, the skirmish game will remain as is, the boxed game isn't a replacement, it will be a separate-but-fully-compatible board game. 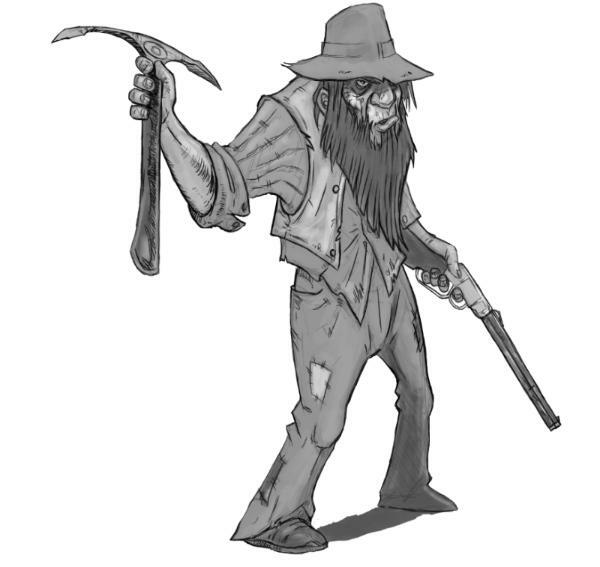 I was trying out several different boxed game ideas in the past, like for the Skinwalker were-beast themed game, or the weird west dungeon crawler. Those things will be likely be done at a later date, probably as other separate-but-compatible boxed games, but the first game will stick to the historical fiction setting we currently have and we'll see where it goes from there. The best way to describe the gameplay would be "Wild West Zombicide Without Zombies" and the fight mechanics will be pretty much the same as the skirmish game. It will be a co-op game with large board tiles (10" squares with maps being 4x4 or 4x6) that show building interiors and dusty town streets, with 1" square spaces. Each player will control a hero from the Vigilance Committee, fighting off raids from the Clancy Gang and the small army of outlaw henchmen in their employ (You can also play solo games, controlling 2 or more heroes yourself). The game will have plastic (PVC) figures and the current Vigilance Committee and Clancy Gang models will be re-sculpted (the current metals will still be available for the skirmish game), and there will be multiple copies of plastic henchmen armed in a variety of ways. At first I was going to go with all new heroes and villains, but I thought it would be best to stick to the current storyline and characters to update the current skirmish gangs, and both gangs will be getting new members in addition to the original 5. Players pick the VC hero they want to control, then set up the town board based on the campaign story you chose and dive into the game, everything is ready to go right out of the box. Each turn someone draws an Action Card that will say what happens, to give the game more of a cinematic feel rather than just "set up and kill". So a card might just have a number of henchman spawn in a given area, or you have to rescue a damsel in distress, or get to the bank before the Boss run off with the cash, etc. And there will be a deck of loot cards, where a player gets to draw one for killing a bad guy or completing an objective. There will also be a campaign system where each hero can earn Fame (XP) after the game, and you can sell your loot for cash that will also add to your fame, or keep your loot if it's an item you want to have in your next game. At certain fame levels you will automatically get a bonus to an attribute or learn a new skill based on your profession. You can use the standard heroes in the box, or create your own. And you can play the set campaign missions in the rulebook, or make your own. Also all skirmish models and boxed game models will be fully compatible with each other, so if you have a favorite character or model from the skirmish game, you can use them in the board game, or vise versa. We'll be doing a Kickstarter campaign (of course) that will begin with probably just 1 pledge level for the base game, and then stretch goals to unlock new heroes and villains that I hope can be added into the boxed game for free. I may also explore re-sculpting other gangs and 2 of them together as new heroes and villains in expansion packs that would also have new board tiles, action and loot cards. Oh and last but not least, a question... when it comes to "survival battle games" like this, is it the miniatures what makes you want it? Or is it more about the story, theme and gameplay? I had been thinking about doing the core game with no miniatures at all, and instead the figures would be cardstock standees on a little plastic base, kind of like the pawns in Pathfinder. Then, packs of miniatures would be sold separately, like a hero pack, boss pack, henchman pack, each with plastic minis, cards and everything you need to add them to the game.... or you can use the minis from the skirmish game. I thought doing it without the minis included would be a great way to get the costs way down and would appeal to more of a board game crowd... and players that want to play with minis could add them in. Anyone think a format like that would work well, or at the end of the day do people just want lots of cool minis? It Sounds great to me. I would prefer a Game with miniatures instead of markers. But maybe I would buy the Game if the Price is low enough and the miniatures are available as add-ons. But Most important of all I want to see reinforcements for some of the other gangs, specially for the Tranquility Crew. Yes the plan is to try and get at least 2 new characters for each gang. I'm kind of planning out stretch goals and extra add-on things in my head. Still a long, long way to go though. Anyway, I'm waiting on some price quotes from the printer for the game without minis, and with the minis, so I can see what the prices will be like. I think I might be into the cardstock method if the price of the core box would be real low, like $30-40 range. But I do kind of think it's the minis that sell the game for this type of thing. If we ended up doing separate minis, they would probably end up being metal like now, plastics would just be for the main boxed game. Another question.. about the board tiles.. would you prefer 1" squares for movement, or 1.5" ? I was planning on 1 inch because that makes the all of the other character stats compatible with both games, you don't have to mess around with math for gun ranges and stuff like that. But, the metal minis have 30mm bases, which are too big for the 1" squares. The plastic minis will have 1" bases (23mm to be exact, just the right size to fit inside the tops of the 30mm round skirmish bases). But, if we had 1.5" squares, all of the minis for either game will fit just fine in any square, except the gatling gun but that would take up 4 spaces on either size squares. So far I'm still planning on 1" but I do kind of like the idea of 1.5" .. what would you prefer? Been thinking about the hired guns, and I'd like to resculpt a couple and make some all new ones. I think we may do them in expansions that have 1 hero & 1 boss and a couple of new henchman types to fight, and then also have new loot & event cards with 2 new board tiles. I was also thinking about the board tiles.. not sure if the separate tiles would work best or maybe a 4-panel fold out board instead, so we could have a larger area detailed in 1 board instead of trying to contain everything in a smaller area? I want the game to play like a dungeon crawler instead of a skirmish game even though the rules are similar. So instead of a dungeon with corridors and rooms it's a town with tightly packed streets with buildings and shanties and canyons. So separate tiles might be more flexible, but 4 tiles together would allow for more detailed maps in the same surface area. So, I think if we're going to do 1.5" spaces, we'll have to go with 9" board tiles with 6x6 spaces. Using all 9 tiles in the box would give you a 27" square playing area, which feels kind of small to me... but I think I still have skirmish game on my mind and not board game. At first I was thinking 12" would be good, but that will be too big, that will mean the game box has to be a little bigger than 12", and then the shipping box also a little bigger still.. shipping boxes over 12" on any side could end up costing more to ship especially internationally. I think 9" will be a good tile size, not too huge and not too small. I've also been giving a lot more thought to the no-minis version. I'm still waiting for price quotes from the printer but if it could have a retail price under $30 I might go for that, and then do the minis separately... possibly also doing a "deluxe" boxed set that will include all of the minis if we unlock them with stretch goals. Giving the minis more thought, I think we would be better off doing all new characters for the heroes and villains, rather than just doing the same characters a lot of players already have. Then we can just do PDF hero and villain cards for the existing gangs and vise versa. I still wouldn't mind resculpting some of the original minis, but that's a project I could save for later or if the campaign starts going really well. Speaking as a big fan of the game.. More Gangs are a big draw to me. All New Characters with online PDF support would be very nice for me personally. Paper Standees sound inexpensive, but if you can kickstart the game .. do NOT add miniatures to the base game unless you have already taken that into account in the funding levels. Right now I'm preparing the cardstock version just in case, I have no idea what kind of preliminary budget we'll have. If we can afford it we can get the minis done too. I have to wait a bit to find out though. I'm going to get some of the initial character sketches done myself though just to get the ball rolling. If we went the paper route I'm guessing the core game would be under $30. I wouldn't want it higher than that. 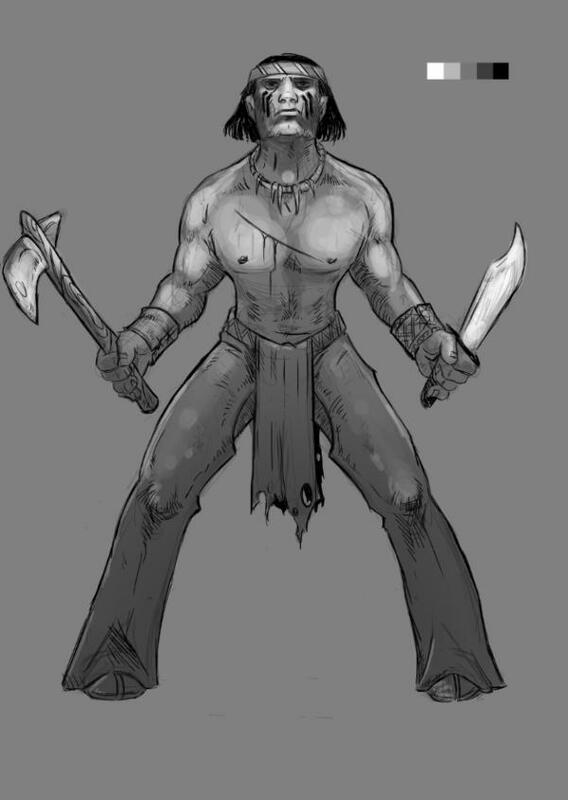 What I was thinking is we'd kickstart that, and then do the minis in metal for stretch goals. If we added anything free to the core game it would probably have to be goals to add in some extra board tiles or punchboard sheets with new characters, we wouldn't be able to add minis to the game if it's that cheap. If it does really really well, I imagine some day later we could do a special deluxe edition that has the minis included in plastic. Since campaign advancement is built into the game from the get-go, for Hero and Boss stats I decided to have everyone start off as tough current Henchmen. So, if you were to design your own hero you would have 10 points to spend raising your attributes. The henchmen in the boxed game will be no-name cannon fodder models, and there will be different types mostly just based on their weapons, but all of them would only have 5 points to spend on attributes. The Hero Cards will have a meter along the side or the top and there will be little plastic marker clips you can use to keep track of Fame levels, or you can just keep score and write it down after the game. As you go along the meter when you hit certain points it will tell you what attributes get raised or new skills you learn. An Infamous Hero will be half way there, and the same strength as professionals are currently. At the end when you're maxed, you'll be a Legendary Hero (same as a Gang Leader) and you can flip the card over to have all of your updated attributes and skills together in 1 place for easier reference. As you kill bad guys, you can draw Loot Cards to get more items that you can keep to use sell after the game. Instead of getting XP for kills, you sell your loot for cash and your total cash = your fame level. Weapons are also going to be more simplified, rather than having 3 different types of each gun there will just be a Shotgun, Repeater and Longarm. For pistols though there will be a Pocket Pistol (derringer), Sixguns and a Hand Cannon. Melee weapons will be fists, 1 handed weapons for 1+ str, and 2 handed weapons for +2 str. Special named weapons will be in the loot cards though as rare items, so you could get a Rolling Block Rifle still, that will shoot a few spaces more than a standard longarm. So, for the skirmish game, we're going to need separate skirmish stat cards for each hero and boss, and then separate hero cards for current gangs. 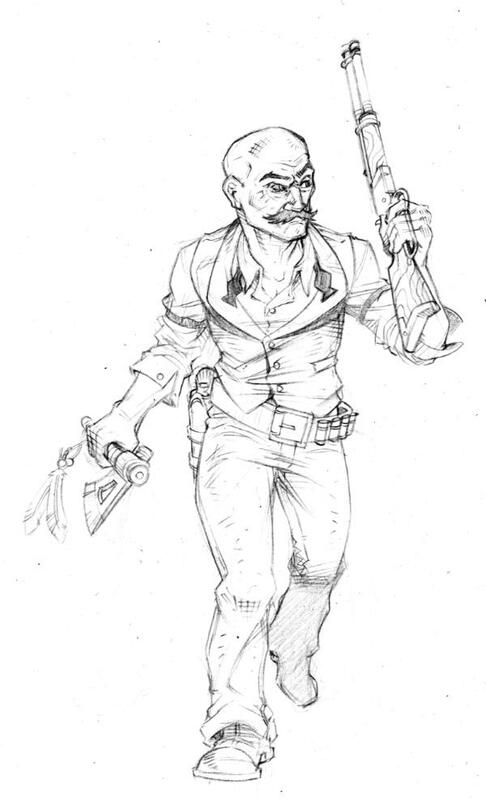 They could be done as PDFs, but would it be weird if a skirmish gang leader is suddenly wimpy in the adventure game? I started thinking it might be more efficient if we had 1 card type to rule them all, rather than making whole separate cards for each game. But, that would be a big change and to do that we would probably mean a BWG 2.0 rulebook, since a lot of character's strengths would change a lot. But we could have skirmish campaigns built in, and there would still be the option of playing pick-up games with the base level characters or the legendary versions. So that means none of the current skirmish gang members would be as tough as they are now.. everyone in would be at the current henchmen level, but would have different stats and items, and advancement would be based on bounties collected for kills since there won't be loot cards. Just thinking it might be cool if both games were more compatible like that, so you can play 2 ways with the same models & stats and it will just depend on the flavor you like better. The boxed game is a co-op dungeon crawler with a bit of a zombicide style survival game mixed in, skirmish is more of a straight up battle game with evenly matched gangs.. Just an idea though, nothing is changing yet any thoughts? So, Stamina = amt of actions you get per activation, and quickness = amount of spaces you move. Movement is 1 action, and it must be your first action, or you can skip movement and just shoot or do whatever else. You can run after your movement, but each space you run will use up 1 action, and you can run whenever you want. So, with 4 actions you could move normally, shoot, then run 2 spaces... or any other combination. You can attack with 1 2-handed weapon or 2 similar 1-handed weapons. You have to use this weapon for your whole activation, but you can fire multiple times. Each additional shot raises your to hit target number by 1. So shooting a shotgun twice, the 2nd shot is +1 to hit, but having 2 pistols will allow you to shoot both of them before you start adding a penalty. I simplified weapons further so they no longer need a strength value. Instead, we have attack power (AP). You roll your dice to hit with a base target number of 4, each successful D6 = 1 AP. Some weapons have AP bonuses, like a shotgun will have +1 AP to any target within 2 spaces. To injure a villain, your AP just has to be higher than their Defense to cause 1 wound. They don't get a saving throw, but bosses all have multiple HPs and higher DP. For villains attacking heroes, they auto-combine their attacks. Henchmen = 1 AP. Standard bosses = 2 AP, Infamous bosses = 3 AP and legendary bosses = 4 AP. When a Hero is attacked, you add up all of the AP for the attacks against him, to a max of 6. if AP would be higher than 6, it becomes additional hits for every point over 6. So, if the total AP is 8, then you will need to have 3 dice out of your roll be a 6 or higher. You roll dice equal to your Defense, and just 1 D6 has to meet or exceed the AP to avoid damage unless there were multiple hits. Multiple hits would mostly just be in campaign games after the heroes and bosses have leveled up a lot. There will be multiple objectives in each game too. The turns are divided into Hero and Villain turns. At the beginning of the hero turn you all roll for initiative and whoever wins draws an event card. It will list how many villains spawn, or have an achievement you can earn for bonus Fame, and sometimes a new bonus objective. After all heroes activate the villain turn happens, and all villains automatically move toward the closest heroes and auto attack. Once all the attacks are done, the next hero turn begins, you roll for initiative again, then draw a new Event Card. Right now, the way it works is you kill a villain and get to draw a loot card. You can keep the loot to use it, or sell it after the game. The cash you make = your fame and there will be a meter along the card that lists what attributes or new skills you learn depending on how high you get. Hero cards will be kind of big, 4x5". The front of your hero card will list the stats for the standard version, and the stats Infamous version of your hero. The back of your card will be the Legendary version that lists all of the stats and skills in 1 place, so you don't need to refer to the meter to see what bonuses you have to factor in. So what I'm thinking now, is maybe to change the hero cards around, instead of having different versions of Infamous and Legendary characters cluttering things up.. side 1 is the Hero card, side 2 is the Villain card for the same character .. so, you could play the game as lawmen or as outlaws. I was planning a separate campaign story for each anyway. There would be no XP meter now, instead you earn fame the same way, but we add in a Fame Deck. When you level up, you draw 3 cards and pick the one that you want. It could be a new skill or raised attribute. You would have to keep this card through the whole campaign... would that end up being a pain to keep track of? I was thinking folks could just throw all their cards into ziplock bags between games... could even include some in the main box. I just thought that might be a fun way to do things more randomly, and with different expansions we could add in all new fame cards with new skills. But, I still kind of like the meter idea with a little plastic pointer clippy thing that points to the bonus you're currently getting. Heroes are feeling too tough, especially as they level up.. so I'm going to drop them down to be as tough as current professionals. Villain Henchmen will be the same as now instead of even wimpier, and villain bosses will be like current gang leaders or hired guns.. they needed to be a little tougher than the heroes, so they're not real easy to kill... and then having the Heroes in the middle, it gives them room to grow. Loot was a bit too plentiful, so now you will only get to draw Loot Cards for killing a boss or completing special objectives. There's usually a lot of henchmen running around, and having each one drop a piece of loot was a little much. Almost every piece of loot is a buff of some kind of a better than normal weapon, so I want it to feel more valuable. One thing I'm starting to wonder about is.. do we need attack attributes? With the Attack Points system we have now, I'm going to drop Melee and Ranged combat and test that next, basically combining them into 1 "Attack Points" attribute. So the idea is, your weapons and skills will help increase your AP.. so all Heroes start with 2 AP. Looted weapons will usually be +1 AP, or +2 for rare ones. And then different skills or professions might have bonuses too, like a Wrassler would get +1 AP in melee, a Gunslinger would get +1 AP for ranged attacks, a Marksman can skip his movement to take aim and get +1AP, etc. Next thing I'm wondering about... as far as getting XP and leveling up, what's better? Gain XP after the game and level up over the course of a few games in an ongoing campaign? Or have each game be more like a self contained storyline, with more of an epic battle with multiple objectives, where each Hero earns XP and new skills during the game, starting out fresh every game? I have the rules all done now with the multi-game campaign in mind, but lately I've been thinking it might be more fun to have everything happen in 1 big game, and then have lots of different scenarios to play. I'll have to test it out... but what do ya'll think would be more fun? Christian is the owner of the Golden Coin Saloon. He was recently deputized by the US Marshals Service to help restore order to the town. 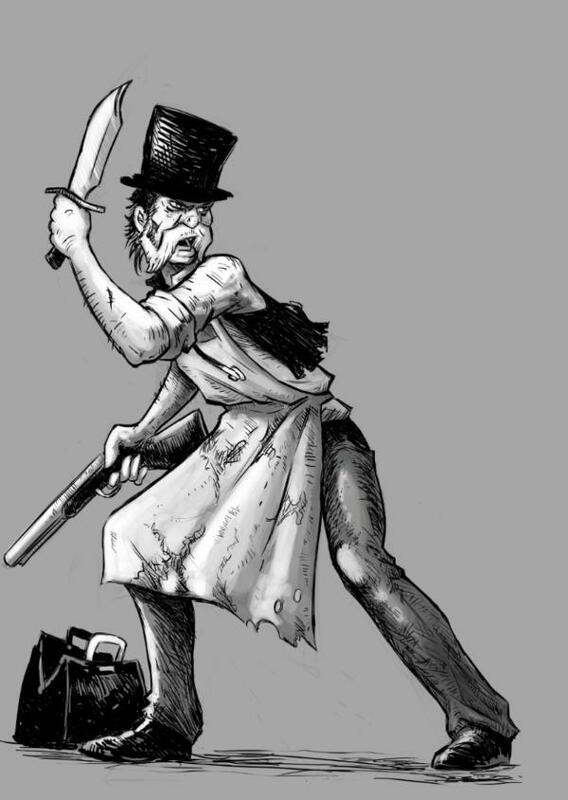 He's a gambler, armed with a Repeater and Tomahawk. Oh and, another thing I think I'd like to add to the rules is night fighting. During the day, you can shoot at anything within your guns range. At night, or in dark gold mines, you can only shoot up to your Attack Power in spaces, unless your target is carrying a lantern or is standing in a lit up space. And also.. playing test games it's feeling like the 1.5" squares on the board tiles are just too big. a 9x9" board tile would only have 6x6 spaces. I think we are going to have to go with the more traditional 1" squares, and the minis in the boxed game would have 25mm round bases. If you want to use your skirmish models with 30mm bases, the rule would just be "try to center your base over the square you want to be on" ... not ideal but still playable in my test games anyway. I want to be able to have 10" square tiles, where you usually just do a block of 4 tiles for most games, or 4x6 for larger games. Going with 10 spaces per board gives lots more options for more terrain and more stuff to do. Been going back and forth over how to incorporate the new Heroes and Bosses into the skirmish game. At first I was going to redo the Vigilance Committee and Clancy Gang, then I thought making all new gangs would be better, but I decided we'll have each board game character just be 1 new member for each current gang.. and then divide the original gangs up into Heroes and Villains for use in the board game. 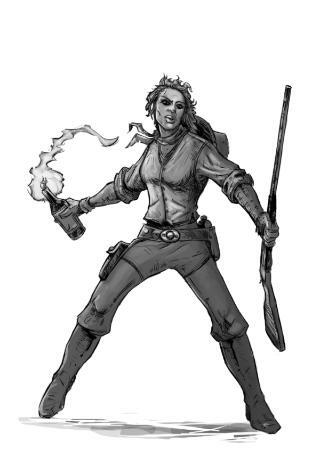 That will give us a good variety of characters in the board game and also expand the skirmish gangs a bit too. Great art, I don't know much about your game, but when I get an itch for a western game I will give it a look. Some new news.. I've decided to not include miniatures in the core game. Mostly for budget reasons. I'd rather focus on making a great high quality game with nice components and all, rather than stretching myself too thin and cutting corners to get minis included, that will also end up cranking the KS funding goal way too high. So the core game will have cardstock standee token guys on little plastic stands, kind of like Pathfinder. The good thing about that is it will keep the core boxed game cost and the funding goal way down too. It will also be a lot easier to make new adventures and expansions. Minis will still be made, but they will be add-on items and they will most likely be metal. I'll start with a hero pack that will be all of the heroes in the core game, then a boss pack with all of the bosses, then henchmen packs... most of that will have to be unlocked with stretch goals in the campaign. I'll see if I can do all of the initial Hero sculpts in advance for the Kickstarter campaign, but others will have to be stretch goals. I decided after the testing is done and I get some finished art done (around October) I'm going to put together a free print & play pack with a sample adventure, and that will be like a free preview of the game and used to promote the Kickstarter that will be around Jan/Feb or so. I'm still really torn on 2 format ideas though. Right now I have it set for separate 10" square board tiles. I like that idea because it's flexible, but I'm also thinking it might be good to do the boards as a 6-panel fold up board, still based on the 10x10 size, so unfolded it would be 6 boards laid out in 2x3, but you wouldn't be able to change the positions. I like the big board idea because it's a town where buildings don't magically reposition themselves. It would be double sided and the flip side would match so you could have 2 boards together for a big game on a 4x3 board... or 4 boards together for a 4x6 epic battle. Each expansion set would get a whole new double sided board too and each side will depict a different area of town. But, still torn since I think separate tiles will give players more options for creating their own adventures and campaigns. Also torn on the hero format. The hero cards will be larger sized with cool art and listing all of their stats and skills on 1 side. The flip side would have the "infamous" version of the Hero where their stats increase and a special new skill. We could also make normal and infamous versions of each hero sculpt. But, I've also been thinking it might be cooler to drop the infamous hero idea and instead have the hero info on 1 side, and the NPC boss stats on the other... so that you could play games with all of the lawmen as heroes and the outlaw characters as bosses... or play with the outlaws as the "heroes" and the lawmen would be the bosses you have to kill, doing a whole new campaign storyline for each side. 9 10x10" board tiles, 3 punchboard sheets with characters and tokens, 1 40 page rulebook, 6 dice, 20 stands for the characters, 11 hero/villain cards, 96 reward cards, 24 event cards, 6 dice, 6 fame tracker clips and a 2 piece box. All of the components are going to be high quality thick cardstock with a nice matte linen finish, and the cards will be the nicest kind they can produce (black core). I have to admit $60 is higher than I hoped, but it's about on par with a $100 game that would include plastic minis too. The minis will have to be done separately in metal and unlocked with stretch goals. I can't afford to sculpt them all ahead of time and I feel nowadays if you can't show all the minis ahead of time, you won't get enough interest because it would also crank the funding goal up to around $50,000 or more. I could also drop the amount of board tiles a little, but that would only change the retail price by $2-3, and I'd rather there were more options. I'll still have to see what some of the other printers can do. I got a 2nd quote today. It's a bit less than the first, but I also changed a few items and dropped it from 6 board tiles instead of 9. This will cut down on the price of the game and the cost to get more art done and all, and I figured I would still plan to do those other 3 boards as stretch goals and add them back into the game for free. Both companies are pretty close in the quote like I expected. I'm just waiting to hear back from the 3rd company and they're here in the US so I'm curious to see what that will be like. I'd prefer to have it made here and not have to worry about boats overseas shipping, but we'll see how it goes. Last week I sent out an email newsletter asking if anyone would like to playtest the new game, got about 100 replies I know most folks just wanted to check out the rules, but I already got some good feedback and hope to get a lot more. Still waiting on some quotes from other printers, but it looks like I'll be able to go with a $50 retail price. The funding goal will still end up in the $20-30k range though, thanks to KS fees and overseas shipping from China. Also planning out the gang expansion packs that will be stretch goals. I haven't decided yet if I want to do 1 current gang as villains and 1 hired gun as a hero, or have it be more like 1 gang of heroes vs 1 gang of villains. I think I'll probably end up going with the latter. Each one will come with 2 new themed board tiles too. Another thing I thought about doing to keep the costs down is have the expansions just be a smaller box, where it's just the character punchboards and stat & loot cards and stuff, and then do board expansion packs separately. So we could offer the 6 boards in the main box separately for folks that want them, and then do another 6 new tiles as a separate pack later on. I thought it might be cooler to have the gangs in their own little themed campaign pack with their own tiles, but that will probably drive up the costs a little since the box will have to be big enough for their boards. I'll have to think about that some more and see which way would be cheaper. 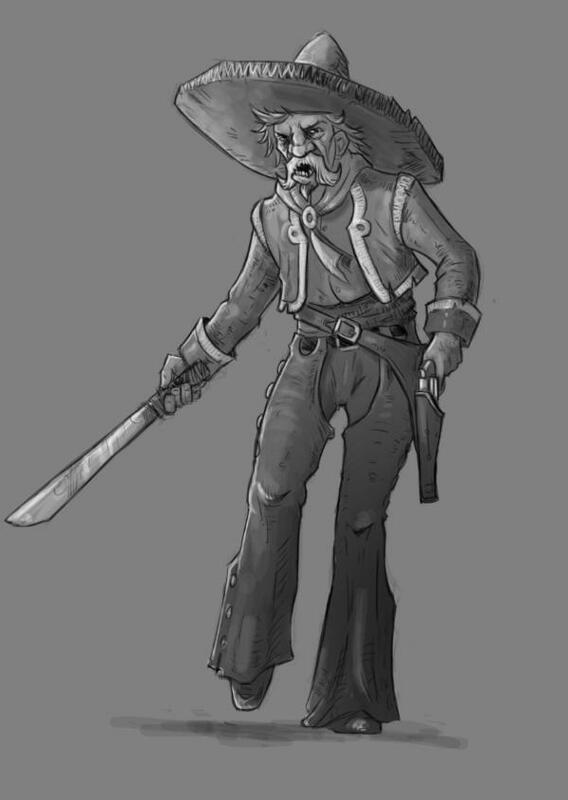 Here's a few more hero concept sketches. 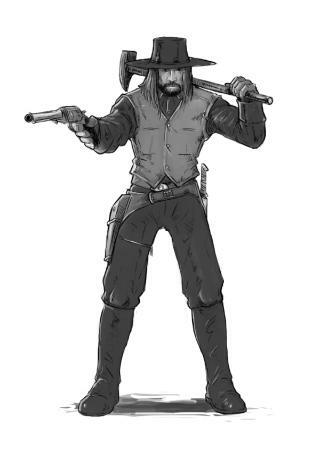 First we have Azalea, a Gunslinger for the Windowmakers, and Colin Bucnanan, a hired gun.. he's kinda based on Bohanon from the show Hell on Wheels. Got some disappointing news today :/ Based on the compnents I plan to have in the box, it's gonna weigh in at 5 pounds. Which I thought was cool, I like that it's loaded with lots of cool stuff. But then I looked at ShipNaked.com prices. It's basically gonna cost $10 to ship to to the US. I can bite that bullet and do free shipping for the US backers by adding a little to the campaign funding goal. But then looking at shipping to the rest of the world, that's gonna cost $50. Ouch. And that's the discounted ShipNaked rate too, normal price would probably be much worse. Needless to say I'm pretty bummed about that, it's going to severely limit the amount of backers.. I mean, that's almost how much the game costs, so you gotta pay almost 2x the price if you live in the UK? not fair :( I hate shipping charges. I think what I'll end up doing is going with a $55 pledge level for US backers. And then have a $95 rest of the world pledge level. Both would have applicable shipping included though, so there's no adding on extra cash or anything, and both will be eligible for freebie bonus items in stretch goals and no additional shipping charges for adding on extra items or anything. If the campaign does really well we could be able to send a shipment to the UK warehouse, but going fro UK to EU would be $40.. a whole $10 savings. We would probably need backers in the thousands before we could afford to do that though, so I can't really count on that happening unfortunately. Is this going to be done with Game Salute? Yes and no. I will be self-publishing everything going forward, which gives me the freedom to do what I want, set my own schedules and assign my own budgets. I will be using Game Salute for retail distribution and for KS fulfillment, using their ShipNaked service, that's mostly because I need to have at least 1500 copies of the game made and I can't store them in my tiny little condo Also because they can take advantage of discounted shipping prices too since they ship so much so often. This time around everything will be sent in a finished retail box all shrinkwrapped, it's all being made in China as a complete board game so it will go right from the ship to the warehouse, then boxed up and shipped to the customer. For miniatures also, going forward I'm going to have Iron Wind metals pack up the minis and bases and everything. I'm hoping things will be a lot more efficient this way in the end. With the recent mess Game Salute has made of their name in kickstarter I wouldn't have backed this, now I will though. Was there some recent drama I might have missed? Haven't heard anything lately but I also haven't been keeping up on anything that's not on Dakka at the moment ... too busy. I do like what they're doing now with ShipNaked. I pretty much set up my own online shop or KS orders, they keep it all in their warehouse and ship out stuff as needed for a small fee. This week I'll be finishing up all of the Mechadrome book and cards and getting that sent out to the printers, then I'll start building the print & play version of the board game. Plan is to have that done around December to be more like a preview for the full game and to promote the KS that will probably be around the end of January. Just need to get the board tile art done next, expecting that around mid-october.